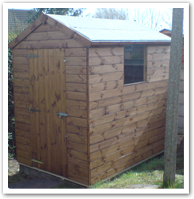 Offering a wide range of garden buildings including sheds, animal shelters, playhouses and more to Gwent, Wales and surrounding area. Carpentry made 15 years experience, any size considered. Bulk orders and trade welcome. I make sheds, summer houses, playhouses, animal shelters and export grade packing cases. Choice of colours, fencing, decking and driveway gates. Willing to make customer's designs, sheds made from P.S.E. timber. Don't buy what is available, buy what you need and want. Any distance considered for delivery service.